Scientists have developed a pressure-sensitive electronic skin which could one day be used to restore touch to patients who have prosthetic limbs. 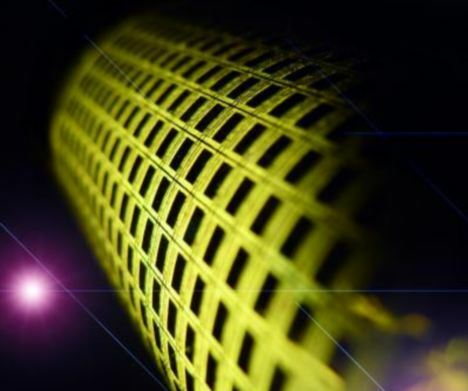 The material, dubbed e-skin, is made from semiconductor nanowires made from silicon. More sinister, however, is the prospect of the invention lending robots the ability to adapt the amount of roce needed to hold and manipulate objects. The nanowires are incredibly thin structures, more than 10,000 times thinner than a single human hair. They open up the possibility for a robot to be able to hold an egg by judging how delicate it is. But in true Terminator style, robots would for once know their own strength - which the hero of those movies, John Connor, would presumably see as bad news. The researchers' stated long-term goal is to use e-skin to restore the sense of touch to patients with artificial limbs. At the same time scientists from Stanford University have developed an electronic sensor that it is so sensitive that can it can feel a touch as light as a butterfly. Manufactured in large sheets, the sensors could be used in artificial electronic skin for prosthetic limbs, robots, touch-screen displays, automobile safety and a range of medical applications. That degree of sensitivity could make the sensors useful in a broad range of medical applications, including robotic surgery, according to the research team. Bandages equipped with the sensors could aid in healing of wounds and incisions. Doctors could use data from the sensors to be sure the bandages were not too tight. Car safety could also be improved with sensitive, 'intelligent' material applied to the steering wheel. 'If a driver is tired, or drunk, or falls asleep at the wheel, their hands might loosen or fall off the wheel,' said Benjamin Tee, graduate student in electrical engineering and a coauthor. 'If there are pressure sensors that can sense that no hands are holding the steering wheel, the car could be equipped with some automatic safety device that could sound an alarm or kick in to slow the car down. At the University of California, Berkeley , research scientists printed nanowires onto an 18-by-19 pixel square matrix measuring 7 centimetres on each side. Each pixel contained a transistor made up of hundreds of semiconductor nanowires. Nanowire transistors were then integrated with a pressure sensitive rubber so that it would be able to detect touch. The matrix required less than 5 volts of power to operate and maintained its robustness after being bent more than 2,000 times in tests. ‘The idea is to have a material that functions like the human skin, which means incorporating the ability to feel and touch objects,’ said Ali Javey, head of the UC Berkeley research team developing the artificial skin. The artificial skin is described in a September 12th paper in the advanced online publication of the journal Nature Materials. It is the first such material made out of inorganic single crystalline semiconductors. 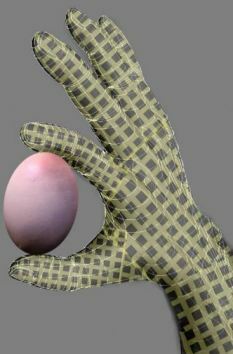 ‘Humans generally know how to hold a fragile egg without breaking it,’ said Javey. The UC Berkeley engineers used an innovative fabrication technique that deposits nanowire ‘hairs’. The researchers started by growing the germanium/silicon nanowires on a cylindrical drum, which was then rolled onto a sticky substrate. As the drum rolled, the nanowires were deposited, or ‘printed,’ onto the substrate in an orderly fashion, forming the basis from which thin, flexible sheets of electronic materials could be built. Previous attempts to develop an artificial skin relied upon organic materials because they are flexible and easier to process. ‘The problem is that organic materials are poor semiconductors, which means electronic devices made out of them would often require high voltages to operate the circuitry,’ said Javey. ‘Inorganic materials, such as crystalline silicon, on the other hand, have excellent electrical properties and can operate on low power. They are also more chemically stable. But historically, they have been inflexible and easy to crack. ‘This is the first truly macroscale integration of ordered nanowire materials for a functional system – in this case, an electronic skin,’ said study lead author Kuniharu Takei. It's a Bird, It's a Plane, It's a...a...Fish! Cute Girl Has A Catchy Dance! !